Leading Manufacturer of pvc floor tiles, gym flooring ( rubber tiles) and gym interlocking rubber floor tiles from Jaipur. With our rich industry experience, we are engaged in offering PVC Floor Tiles to our client. The offered tile is designed by a skilled team of professionals using high grade basic material, sourced from reliable vendors of the market in compliance with the set parameters of the industry to meet the industry standard. This tile is highly demanded in the global market for its size, shape and design. Client can avail this tile from us as per their precise needs. Western Our firm has gained huge appreciation in the market for supplying a quality assured array of Outdoor Rubber Tiles. Offered tiles are artistically designed by our creative artisans using the finest grade raw materials. 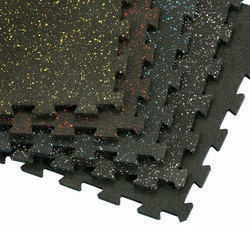 In order to furnish sparkling manifestation into these tiles, our experts use exciting colors in finishing of tiles. Widely used for outside exercising and playing area over carpeting, these Outdoor Rubber Tiles are offered at very affordable price to the clients. 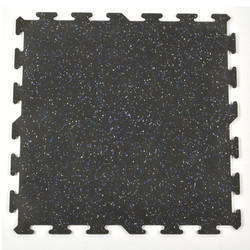 Being one of the reputed organizations in the market, we are engaged in offering an exclusive range of Gym Interlocking Rubber Floor Tiles. Our offered tiles are designed using the best quality raw material and advanced technology under the guidance of our skilled personnel. These tiles are tested on well-defined parameters of quality, in order to offer flawless items at clients' end. Further, clients can avail these tiles from us in various sizes and designs.